Plug and play over wireless networks. The Brother QL-810W, our fastest label printer of up to 110 labels per minute will ensure you’re always one step ahead, whatever your business. Providing unprecedented flexibility and creative possibilities for users, this device prints in both black and red text, enabling a variety of use applications including warnings, special identification of persons on name tags, highlighting important messages, emphasising offers on signs or for practical reminders. 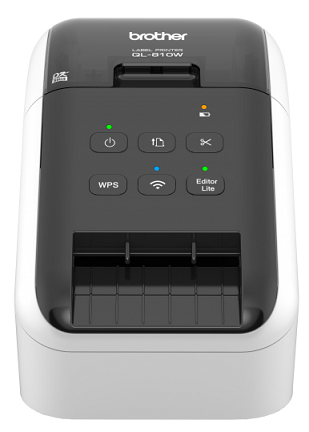 Offering wi-fi connectivity capabilities, an integrated cutter and software for designing your own labels, and an optional Li-ion battery supporting mobile use, the Brother QL-810W is the professional tool you’ve been looking for. Unique direct thermal technology that allows you to print in high visibility in black and red on the entire label. Rapidly prints black and white labels for envelopes, packages, file folders, barcodes and assorted business uses. The only office category label printer to offer the technology that lets you print two colours over the entire label! Brother DK Die Cut Labels are convenient pre-sized labels that are pre-cut into label shapes/sizes commonly used in mailing and administrative applications. DK Continuous Length Tapes offer added flexibility. These convenient paper tape and film labels allow the user to determine the label length. Continuous Length Tapes are compatible with Brother QL Label Printers.